After years of trying, Lima was losing hope of finding a job. His brain injury meant that he required his service dog, Blue, with him at all times. Lima had trouble understanding people if they spoke quickly and experienced anxiety associated with his confusion, a symptom which Blue helped to ease. 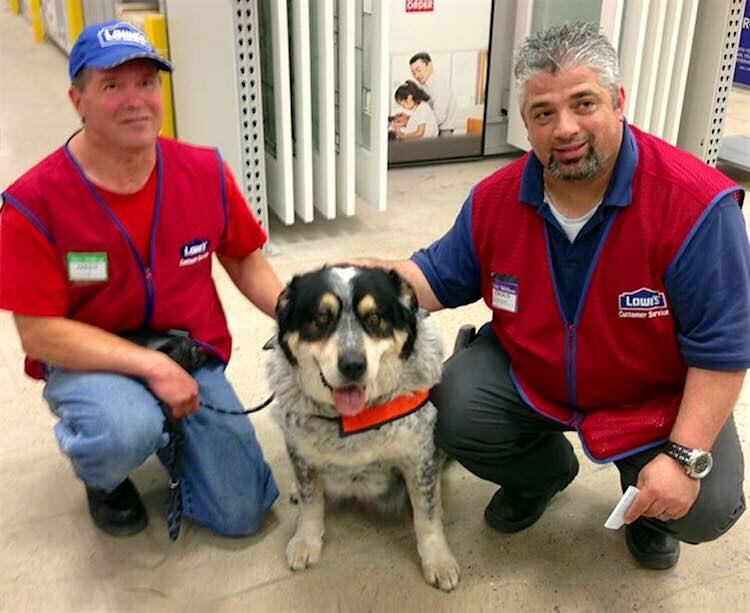 A Lowe’s store in Canada, however, not only hired Lima, but offered Blue a “customer service” position, bringing Lima to tears. Now the two work side-by-side, both in totally terrific matching uniforms. Auckland-based tattoo artist Benjamin Lloyd could never have anticipated the popularity of a post he put on Facebook, asking for 50 likes to go to Starship children’s hospital to “tat all the kids up”. After receiving 400,000 likes, he started creating designs to airbrush on to the sick children’s arms. Benjamin claims that the tattoos give the kids a huge confidence boost, and distract them from the routine of hospital life. “The only bad thing is that they don’t want to take a shower afterwards,” he laughed. You can find Benjamin’s Facebook page here, where you can check out some pictures of the gnarly-looking kids! If you, like me, are completely bummed that we’re not all zipping around in flying cars by now, I’ve got some news that might cheer you up. Google co-founder Larry Page is reportedly supporting two startups, Zee Aero and Kitty Hawk, creating some of the world’s first flying cars. The contribution by page is said to be over $100 million, but the projects are very much being kept on the down-low, with only very sparse details being released. Excited yet? 10-year-old Emma Bennet could not believe her eyes when she unwrapped a surprise present from her parents. Doll company American Girl had partnered with A Step Ahead Prosthetics to create a doll just like her – with a prosthetic leg. The doll came with a personal note from American Girl, explaining that they had recreated the doll on request from Emma’s parents. “You’ve got to be kidding me! She’s got a let like me!“ Emma cried with delight upon seeing the doll. It’s hard not to be moved when watching the video!